2-John Crothers was born on 2 Jul 1849 in County Tyrone, Ireland, died on 7 Jul 1916 in Winnaleah, Tasmania at age 67, and was buried in Jul 1916 in Branxholm Cemetery. 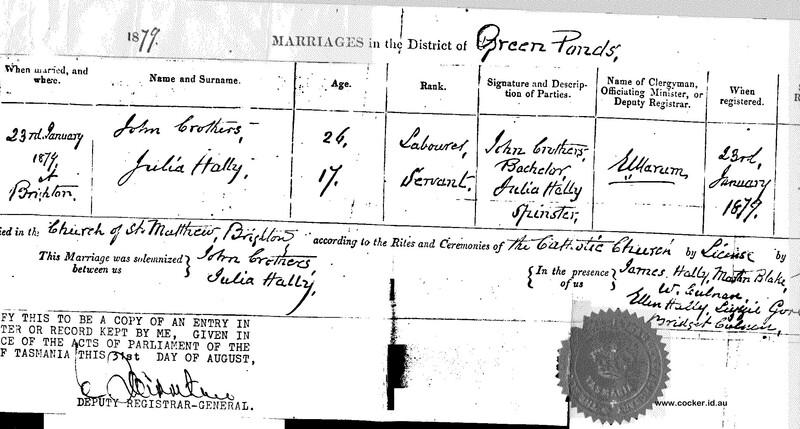 John married Julia Teresa Hally, daughter of James Hally and Margaret Casey, on 23 Jan 1879 in Brighton Catholic Church, Pontville. Julia was born on 1 Dec 1861 in Brighton, Tasmania, died on 3 Nov 1920 in Winnaleah, Tasmania at age 58, and was buried in 1920 in Branxholm Cemetery. John’s birth, at home in Great Oxford Street, Liverpool, England, was registered by his father, Joseph, in the Sub-district of Saint Martin on 1 August 1849. The date given was 2 July 1849. This date conflicts with that of 13 June recorded by Joseph, among other family events, in a psalm book. Julia was born on 1 December 1861 in Brighton, Tasmania, the fifth of nine children of James and Margaret Hally. James had been transported from County Tipperary for burglary, arriving in Hobart in 1853. He spent the last five decades of his life as a well-respected blacksmith at Pontville. John left Liverpool for Tasmania as a 6-year-old, accompanying his parents and baby brother, Henry. He grew up in the Brighton area, at Pontville, where his father was stationed as a policeman. Near the police station was the Hally smithy. James would surely have had among his jobs the shoeing of the horses used by Joseph Crothers and his fellow troopers. A romantic notion has John noticing Julia, the daughter of a local blacksmith, as she grew up. But he had left for Victoria while she was still well under 10 years of age. Nothing was known about John, up to his marriage in 1879, until a folder containing details of his father’s intestacy was discovered in the Tasmanian Archives in 2016. It is not known when or why John went to Kyneton. He had probably found it hard to get employment as a farm labourer in Tasmania. “The inhabitants of Brighton were mainly employed in agricultural pursuits…(there were) no ports, mines, exports or imports, and the one industry was quarrying, which employed only six people.”[ii] He may have responded to a call for workers in the growing areas north of Melbourne. He may even have tried his hand first at gold mining. John evidently arrived back in Pontville some days after his father’s funeral, stayed for about three weeks and returned to the mainland on 17 March. He wrote to Charles Wright, his father’s immediate superior, from Melbourne on 20 March authorising the payment of 2 pounds to Alexander Finlay, who had loaned him the sum. It seems Finlay had sent the money to John to enable him to pay the cost of his voyage home. The amount was to be deducted from John’s share of the estate. John, as the eldest, was entitled to the property at Dromedary. A sale was soon organised, indicating John had no intention, at that stage, of returning to the area - or perhaps he just needed the money. John proposed taking his orphaned sister, Elizabeth, to Melbourne to live with a relative. He also promised to give her his fifth share of his father’s estate. It seems he was able to honour the promise in January 1879. It is not known when Elizabeth left for Melbourne nor when John returned to live in Pontville. It is likely he returned to Pontville not many years or even months before his marriage at the age of 29 on 23 January 1879. Julia was 17 years and 53 days old. The trooper’s son had married the burglar’s daughter! The wedding was held in St Matthews, the Catholic Church south of the Pontville bridge, rather than in St Marks, of the Church of England on the hill on the northern side of the bridge. It was recorded in The Mercury on 24 February 1879 and repeated in its Monthly Summary for Europe on 19 March 1879: Crothers - Hally - On January 23 at St Matthews Church, Brighton, by the Venerable Archdeacon Marum, John, eldest son of the late Joseph Crothers of Bridgewater, to Julia Teresa, third daughter of James Hally, blacksmith, Brighton, Tasmania. 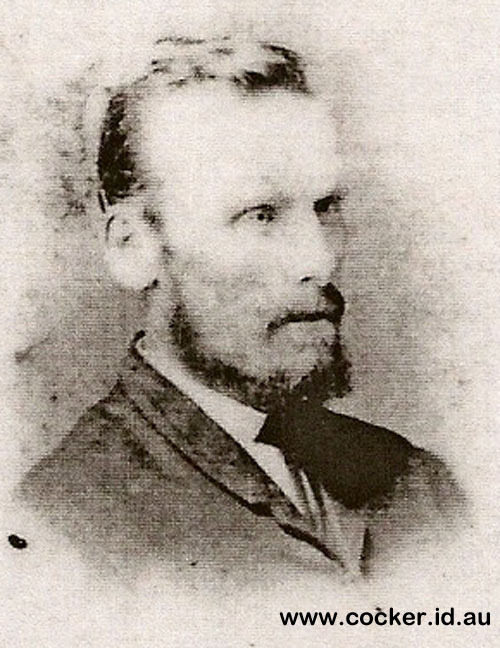 The witnesses were James Hally; Julia’s sister, Ellen; Martin Blake, an employee of James and due to marry Julia’s eldest sister, Mary, 10 years later; Bridget Culnan; W. Culnan; and Lizzie Gore. The last three were probably friends of Julia and fellow Catholics. 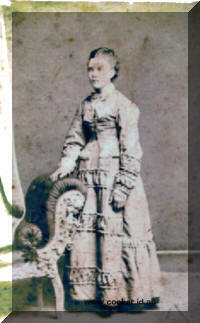 Their first child, Elsie Teresa Josephine, was born in Brighton on 28 January 1881, when Julia was 19 and John 31. Just over two years later, Ellen Allicoque, to be known as Nellie, was born in Brighton on 4 February 1883. The family moved to the northeast of Tasmania between March 1883, when Ellen was christened at Pontville, and 22 September 1884, when their third child, Eveline Julia, was born in the district of Ringarooma. This seems to show they were at Derby by then. The book As the River Flows states that the family lived at Karoola before moving to Derby. [i] If so, the stay must have been brief. (The information evidently came from a granddaughter, Mary Stevens, daughter of Ruby). Perhaps, John was attracted by gold finds in the Karoola area and, not being successful, then moved further east to Derby, where tin had been discovered by the Krushkas in late 1875 or early 1876. Julia’s sister, Bridget, married Michael Mackey in 1888 and moved to the Karoola area at Michael's second appointment as a policeman in 1890. Bridget remained Julia’s nearest sibling for the rest of Julia’s life. Violet, wife of Julia’s youngest son, Albert, could remember travelling to Karoola in the 1930s to visit the Mackeys. (Bridget had died in 1922 but Michael lived till 1947). John worked as a miner for about 18 years, living in a cottage in Derby, the kind which can still be seen on the southern hillside of the town as well as at the local museum, the Derby Tin Mine Centre. He was among the account holders of the Derby branch of the National Bank of Tasmania, as seen in a bank ledger “covering the period from 1895 onwards.”[ii] One gets the impression he was determined to build a balance. Life may have been a struggle for the young family as “the beginning of the 1890s saw a general state of comparative depression descend on Derby and surrounding areas.”[iii] The price of tin continued to decline for a number of years, before a revival at the turn of the century. Somehow, John managed to save enough money to enable him to purchase some land. 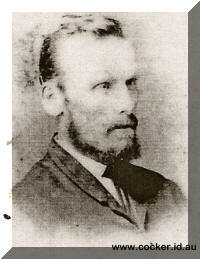 John first appears as holding land on the annual Valuation Roll for Ringarooma in 1901. John Crothers of Derby is shown as leasing, from the Crown, with W. Johnson, 100 acres of grazing land on Main Creek, which flows west from the direction of Weldborough, joining the Ringarooma River at the eastern end of Derby. The area was reached along the Mutual Road, named after the most prominent mine there. The Annual Value of the land was 5 pounds. W. Johnson was probably William, one of the earliest settlers of the area. It is likely John and William were running some cattle there with a view to supplying the meat market at the various minefields. The land reappears on the 1908 Valuation Roll, suggesting the lease had been maintained but missed off in the intervening years. More importantly, John is also shown as owning and occupying 100 acres, Lot 20570, in the Parish of Branxholm, which was then the area between the Boobyalla and Ringarooma Rivers north of Derby. The property was at the foot of Toronna Hill. The township which grew up to serve the new farming district was called Toronna until it was renamed Winnaleah about 1919, in order to remove postal confusion with Taroona, south of Hobart. Nearing the end of the nineteenth century, a push for opening up more land to farming had been growing in Tasmania. “The principle that the government should assist landholders financially was first accepted in the State Advances on Land Act 1898.”[i] In 1901, the Land for Settlement Act established a Board of Land Purchase Commissioners, who promoted a “scheme designed to encourage closer agricultural settlement.”[ii] This became the Closer Settlement Board in 1906. It seems John required little encouragement or support as he went about realising what must have been his dream of becoming a farmer on his own land. He evidently selected some available Crown Land on the understanding that he could pay for it later, when he was in a better position to do so, as long as he made improvements to the land; that is, it was a Conditional Purchase. He named the farm Yambacoona, after the ship which had begun trading along the northern coast of Tasmania in 1899, following its construction in Launceston. The Yambacoona may have carried off some mineral ore which had enabled John to acquire land. In the 1904 and 1905 Valuation Rolls he is shown as a partner with S. Kerrison and T. Wall of Derby in mining leases of 20 acres at Moorinna. (S. Kerrison was probably Stephen, who was shown on the 1887 Valuation Roll as leasing a cottage in Derby. “He was an early pioneer of the tin mining industry, who…spent practically all his working life prospecting and mining in the Derby area.”[iii] T. Wall was probably Tom, whose home was swept away in the 1929 floods.) In 1900, S. Kerrison “and others” of Derby had leased 10 acres for a gold mine. It is tempting to imagine John Crothers transporting a quantity of gold down the Old Port Road to the docks at Boobyalla at the mouth of the Ringarooma River, seeing the load aboard the Yambacoona and resolving to use the ship’s name for the farm he had selected. Lot 20570 had an Annual Value of 4 pounds and a Capital Value of 133 pounds. Not until the Valuation Roll of 1906, when the Values had risen to 20 and 250 pounds respectively, is it revealed that the Conditional Purchase of the 100 acres was made in April 1900. And then, in 1908, the term of 14 years is added to the information supplied. The land became a Purchase Grant on 17 March 1915, for a payment of 133 pounds 6 shillings and 8 pence. The land was more accurately measured as 99 acres and two roods, excluding a reserved road which occupied 75 links on part of the southern boundary. The neighbours were Clyde Wellesley Tucker to the north, Clara Button Tucker to the northwest, Crown Land and Osborne D. Rainbow to the west and the Tasmanian Mineral Exploration Company to the east. The block appears on the modern Tasmap 1:25000 Series, Pioneer sheet, as number 0352. The 1915 title deed shows on the southern boundary of Lot 20570 another property held by John – Lot 26155. This is the land on which the Yambacoona homestead is still standing and which John must have acquired some time before the Valuation Roll of 1906 was published. The size was 97 acres 2 roods and 3 perches, excluding the reserved road. This block had as neighbours Clyde Tucker to the east, Denis Counsel to the west and Lucy Counsel and John Groves to the south. The northwest corner of the block was at the junction of the roads now known as the Banca Road and the Banca Link, which cuts diagonally across it. Crothers Creek flows from east to west across the block before emptying into Trout Creek, which joins the Boobyalla River. The block is number 0353 on the Pioneer sheet. These were the two blocks which comprised the farm John bequeathed in his will of 1914. The eldest son, Walter, signed a Deed of Release on 6 June 1925. Albert’s share passed to his widow, Violet, after his death on 26 December 1941. On 4 August 1926, William, Arthur and Albert, paid 128 pounds 13 shillings and 4 pence for the Purchase Grant of block 26155. A couple of weeks later, on 21 August 1926, the Crothers brothers purchased Lot 20576, 40 acres and 9 perches, for 26 pounds and 6 shillings. This was part of the Crown Land on the western border of Lot 20570. There was more Crown Land further west, with Keith Tucker to the north and Stella Stevenson to the south. Lots 20570, 26155 and 20576 remained in the family until 23 September 1954, when they were transferred to the Closer Settlement Board. The remaining Crothers brothers had decided to leave the district. There were other land deals. In the 1903 Valuation Roll, John is the owner of 90 acres of bush land at Springfield, to the Capital Value of 130 pounds and an annual value of 10 pounds. The land was leased to a Mrs. Eliza Butwell, who continued to pay rent until at least 1908, the Annual Value having risen to 15 pounds in 1906. John may have had in mind the possibility of moving to Springfield – about 20 kilometres west of Yambacoona – at a later stage; he may have seen it as a future farm for one of his sons; or he may simply have taken the chance to invest some money in property. He may have bought the property on the recommendation of his Toronna neighbour, Clyde Tucker, who owned adjoining land at Springfield. On the North by 35 chains and 61 links Easterly along land purchased by Clyde Welsley Tucker commencing at the South West angle thereof on a reserved road on the East by 22 chains and 36 links Southerly along Crown Land on the South by 52 chains and 2 links Westerly along land purchased by Michael Polley (crossing another reserved road one chain wide) to the first mentioned reserved road and thence by that road for a distance of 31 chains and 53 links North Easterly in several bearings (recrossing the last mentioned reserved road) to the point of commencement. This title was cancelled and a new title registered: Volume 213, Folio 59. On 27 June 1913, the land was transferred from John to Cosmo McCausland Whish-Wilson of Springfield. Whish-Wilson secured a mortgage for 350 pounds, presumably the sale price. If so, the value of the land had more than doubled in 12 years and John must have been pleased with his investment. 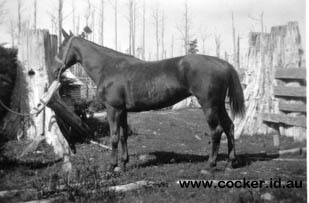 In 1904 and 1905, John leased land on the Boobyalla Road from M. Tucker of Derby. These 316 acres had a Capital Value of 700 pounds and an Annual Value of 30 pounds. In his other dealings, he had been noted as J. Crothers or Crowther of Derby, apart from 1901 and 1902 when he was shown as occupying Yambacoona; this time he was John Crowthers of Moorinna. In 1906, for the first time, a Crothers son – Walter, now in his twentieth year – appears on the Roll. In fact, Walter has four purchases, all of 50 acres. Two are conditional: at Talina and Oana Parish. The two others are in Oana Parish and Branxholm. The Capital Values vary from 25 to 68 pounds. The four properties were still in Walter’s possession in 1908. In 1887, Julia, 25, must have travelled back to Pontville from Derby to be a sponsor at the baptism at St Matthews on 15 May of a niece, Margaret, daughter of her sister, Catherine, and Phillip Deveraux. John and Julia had daughters aged 6, 4 and 2 and a son aged 7 months at this time. Four more daughters were born between 1888 and 1895, with the seventh daughter and eighth child, Kathleen, being born on John and Julia’s 16th wedding anniversary. A second son and an eighth daughter were born before the end of the 1800s. The third son, Arthur, was the last of the seven children born in Derby, in September 1900, five months after John had taken possession of land to the north of Winnaleah. The family probably remained in the Derby cottage until John had prepared a suitable dwelling. Family lore has it that their belongings were loaded onto a wagon with the younger children, while the older children ran alongside, all the way from Derby to the new farm. The twelfth and last child, Albert, was born at the new farmhouse in the area then known as Bradshaw’s Creek. The birth occurred 4 years and 2 months after that of Arthur, the longest gap between any of the 12 births. By the end of 1904, then, John and Julia had 12 children under 24, after just short of 26 years of marriage. All 12 survived childhood. It is family tradition that John agreed to Julia bringing up the children as Catholic but would not be doing anything to help. Once the move from Derby to Yambacoona came, Julia was faced with a weekly journey by horse and cart (she had to get them ready herself, although Walter as a teenager must have been available to help) back to the nearest Catholic Church at Derby. By the time youngest child, Albert, was born in 1904, Julia would have had children aged 4, 6, 8, 9, 12 ,14, 16, 18, 20, 21 and 23. Consequently, the journey was beyond her and Albert did not receive the Catholic upbringing of the others. Access to a priest must have been spasmodic in the early Derby years. On Christmas Day 1897, four of the children, Walter (aged 11), Elizabeth (9), Kathleen (almost 3) and William (1), were baptised at the Catholic Church in Derby. The daughters born in Pontville, Elsie and Ellen, had been baptised in the convenient St. Matthews, 37 and 31 days respectively after birth. Once settled in Yambacoona, it is unlikely that John and Julia left the area very often. John did travel to Deloraine for the wedding of their eldest, Elsie, in 1902. A photo published in the Weekly Courier of 3 May 1902 shows John as part of a double wedding party. Elsie had married Alfred King in the Presbyterian Church on 2 April and Alfred’s sister, Maria, had married William Wright of Hagley. Julia may have gone too, but the denomination of the church may have seen her stay at home. And Arthur would have been just 19 months old on the wedding day. John is likely to have taken a horse and cart to Scottsdale (the railway line did not reach Winnaleah until 1919), caught one train to Launceston and another to Deloraine. Both may have returned to Pontville for the funerals of Julia’s parents, that of James in July 1903 and that of Margaret in November 1907, and even to Hobart for the wedding of Julia’s youngest sibling, Nicholas, in June 1908. Again, the train service would have made such journeys reasonably smooth. Yambacoona must have been a lively place in 1905. The Crothers were just a few years into building a prosperous farm from the bush, with only one daughter, Elsie, who had definitely moved away and their last baby, Albert, to care for. Some of the daughters may have moved out in order to work for neighbouring families, but most would have been available to help their mother. Ellen was 21, Eveline 20, Walter 18, Elizabeth 16, Eileen 14, Ruby 12, Kathleen almost 10, William 8, Ella 6 and Arthur 4. And there were the first grandchildren nearby. The first, Elsie’s son, Len King, had been born in 1903, a year before his Uncle Albert. Elvie King was born in about 1905. The Kings lived in Derby, where Alfred was a carter. Gradually, the family moved apart. Eveline married Bill Miller in 1905. They lived in Derby, where Bill was a mine carpenter. Next to marry was Ellen in 1910, at the Holy Trinity Rectory, Westbury. Julia disapproved of the marriage to Edward Layton of Springfield it is said, so the Laytons left for Victoria, where their four daughters were born in the next ten years. These girls were almost certainly never seen by their maternal grandparents. Then, Elizabeth was married in 1911 and her only child, Jean McClenaghan, was born in 1912. By the later years of the first decade of the twentieth century, The Toronna district had grown to such an extent that a one-room school was opened on 22 April 1909. The very first pupil admitted – that is, number one on the admission register – was Kathleen Crothers. Now 14, Kathy had been attending Derby State School. Her younger siblings, William, Ella and Arthur, would also have gone to the new school, which was situated in the town centre at the junction of Banca Road and Racecourse Road. Albert would have been the last to attend, in 1911, when he had reached six. And so began the very successful school careers of the Crothers children and grandchildren at the Winnaleah School, lasting into the 1950s, with various cousins particularly prominent in the 1930s and 1940s. In 1934, the school was moved to a site near the new centre of Winnaleah and a second room was added. On the 1914 Electoral Roll, only Eileen, then aged 24, was listed as living at Back Road (now the Banca Link Road) with her parents. Ruby, 22, was in Winnaleah. The five youngest children, from Kathleen, 19, to Albert, 10, were all below the voting age of 21 and, presumably, still living at home. Walter, 28, was evidently living in Derby, according to his wedding certificate of June 1915. Ruby was listed as being back home in the 1915 Electoral Roll. Eileen would have been in Launceston for the birth of her first child. By then, John and Julia had about seven living grandchildren, the nearest being in Derby. Their second son, William (Bill), enlisted in the AIF at Derby on 28 March 1916, aged 19. He had not served before because, according to his Attestation Papers, he was from an "exempt area" - a "farm hand". He was certified "fit for active service." He took the oath at Claremont Camp on 28 April but not until 7 August was he approved to serve in the 19th Regiment, 12th Battalion by its Commanding Officer, Lieutenant L. Brownell, at Claremont. He left Australia from Hobart on 8 August on the Ballarat and arrived at Plymouth, England, on 30 September 1916. It is likely that Bill’s departure was delayed by sickness to his father. John was interred in the Branxholm Cemetery. Our Derby correspondent writes: - One of the pioneers at the North-East Coast, in the person of Mr. John Crothers, passed away at his residence, Yambacoona, Winnaleah, on Saturday last, and was interred in the Branxholm Cemetery on Monday, there being a large number of the residents of the district present. The Rev. R. Gibson conducted the service. 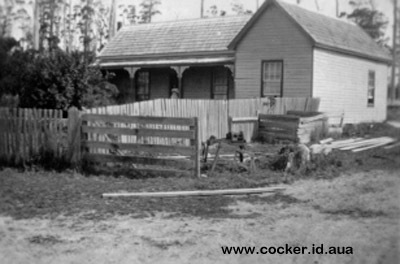 The deceased came to this district in the early days of mining, and worked on the Krushkas Brother's Home Mines for many years, after which he took up the dairying business in connection with Mr. W. T. Tucker, and, being most successful, purchased 200 acres from the Tasmanian Mining Exploration Company, which he transformed into a fine homestead. He was very successful as a farmer, and had a fine dairy herd of about 50 cows. He leaves a widow and a large grownup family of sons and daughters, for whom much sympathy is expressed. About two years ago he developed heart disease, from which he eventually succumbed. In his Will, dated 12 November 1914, John bequeathed his farm "containing and consisting of two blocks" (No. 1 - 100 acres, no. 2 - 96 acres one rood 37 perches). all stock, machinery, farming implements, "all household furniture, goods and chattels including piano and sewing machine" to Julia for her lifetime. She was to receive 25% of the annual profits with 75% going to Walter and William until Arthur reached 17 and became a partner. Then Julia would receive 20% of the profits and the 3 brothers equal shares of 80%. The fourth son, Albert, would become a partner on his 17th birthday in 1921. If a son decided to leave the farm, he would receive "one quarter of the assessed value of the farm and one quarter of the value of the stock" from the remaining partners. At Julia's death, the sons aged 17 and above and still on the farm would have equal shares. Frank Reginald Mackenzie and Herbert Callow Pilbeam were appointed executors. The witnesses were H. (or A?) Lefevre and Jas. P. Murdoch. The will was "exhibited and proved" before the Supreme Court on 17 May 1917. "The lands goods chattels rights credits and effects of the said deceased...did not exceed in value the sum of two thousand and thirty four pounds." When the probate was granted on 13 July, the sum was 1 957 pounds. H.C. Pilbeam and F.R. Mackenzie were locals, probably old friends from John's mining days. Walch's Almanac of 1917 showed Pilbeam as Secretary of the Derby Tennis Club. Messrs Lefevre and Murdoch were members, probably the patriarchs, of two of Winnaleah’s pioneering families. At the time of their father’s death, Elsie was 35, Ellen 33, Eveline 31, Walter 29, Elizabeth 27, Eileen 25, Ruby 24, Kathleen 21, Bill 19, Ella 17, Arthur 15 and Albert 11. The widow, Julia, now aged 54, suffered a further blow when William left on the Ballarat one month and one day after his father’s death. For the next two years and three months at least, Julia, like thousands of Australian mothers, would have been dreading the arrival of bad news from the front line. The Weekly Courier, a Tasmanian paper published each Thursday, reported in the 18 October 1917 edition: "Mrs. J. Crothers, Winnaleah, has been advised by cable that her second son, Private W. J. Crothers, has been wounded in France. It was gunshot wound in the left shoulder and severe." William, or Bill as he was usually known, was wounded in action for the second time on 23 August 1918, with a severe abdomen wound in the lumbar region. This came 12 days after he had earned the Military Medal, acting as a Company runner passing through extremely heavy shellfire, rather in the way of Mel Gibson in the film, Gallipoli. Julia received advice of the second wounding in mid-September. Late in the month came the news that her son had been removed from the seriously ill list. A letter dated 23 November was sent to advise that Private Crothers was convalescent and another, 17 January 1919, that he was returning to Australia. The Weekly Courier of 27 March 1919 reported in The News of Winnaleah by Aza: "Two more soldiers have returned to their respective homes, namely Privates W. Crothers and R. Bolch. Private Crothers has lived in this place since long before it was called Winnaleah, but Private Bolch's home is at Bradshaw's Creek, though he enlisted here." The 17 April 1919 edition of The Weekly Courier reported under the heading Soldiers Welcomed: "The hall was crowded as it had seldom been before on Wednesday (9 April), the occasion being a welcome to two soldier lads - W. Crothers and R. Slatter. Another boy - Roy Bolch - should have been welcomed, but, unfortunately, he was in another part of the island. Framed certificates were presented by the chairman of the reception committee (Mr. W. Tucker) and Mr. Saville responded on behalf of the soldiers. Music was supplied by Mr. Wade, assisted by Miss Healey, Mrs. Coombe, Mrs. Eaton, and Mr. Roy Krushka (violin). Mr. Fred Clark carried out the ceremonial duties. A laid-out supper was served by the ladies." One can easily imagine Julia’s mixture of pride and relief that night in the Winnaleah Hall. And how much she regretted John’s death of nearly three years before when she received a letter, dated 26 September 1919, addressed to Bill's father who had been named his next of kin on his Attestation Paper at enlistment. The letter was from the A.I.F. at Victoria Barracks, Melbourne, with a "copy of extract from Second Supplement, No. 31338, to the London Gazette, dated 13th May 1919, relating to the conspicuous services rendered by" her son. The award was also "promulgated in (the) Commonwealth of Australia Gazette No. 109, dated 15th September 1919." The 1916 Electoral Roll for Bass, subdivision of Ringarooma, showed Julia as the only adult resident of Yambacoona, with Ruby living in Winnaleah. The 1917 Post Office Directory showed Julia as a farmer of Winnaleah, as was Walter. In 1917, there occurred the passing of the first of the twelve members of the next generation. 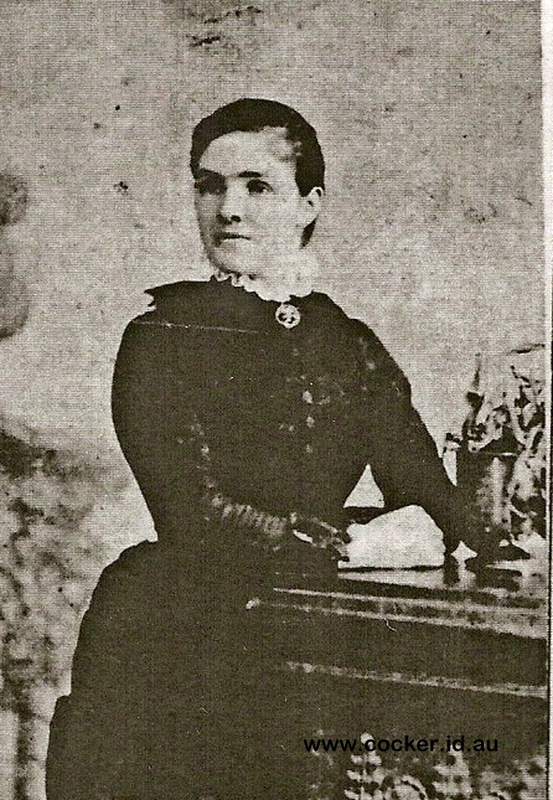 Elizabeth Mabel, known as Corrie, died at the residence of a cousin, 164 Liverpool Street, Hobart, on 12 May. She was just 28. The body was taken to the northeast. The funeral service moved from the Roman Catholic Church at Branxholm to the Branxholm Cemetery. Corrie’s only child, Jean, aged just four and a half months, stayed at Yambacoona for seven months before being sent to her father’s cousins at Sheffield. She remembered her grandmother as looking rather large and as being severe. She was slapped for getting greasy from playing on the carts in the big shed out the back of the farmhouse and was sometimes sent to bed without a meal – her aunts, Ruby and the other sisters, would help her by putting biscuits under her pillow. Julia, however, could hardly be blamed for being somewhat testy. Her husband had died the previous July, leaving her with married children aged 35, 33, 31, 29 and 27, with only one, Walter, still living close by, and unmarried children aged 24 (Ruby, still living at home), 20 (Kathleen, probably working in the district), 19 (William, in the army and about to leave for overseas), 17 (Ella, probably still at home), 15 (Arthur, probably available to work the farm with Walter) and 11 (Albert, presumably still at school). Moreover, one daughter, Eileen, aged 25, was about to be permanently dismissed from Julia's life, following her second unmarried pregnancy. One of the married daughters, Ellen, had evidently married against her mother's will. And her own health could not have been good - she was 54, the mother of 12 children born between her ages of 19 and 42, and she was due to die as a “patient sufferer” three and a half years later. She was suffering from dropsy, now called edema – the increase of interstitial fluid in any organ. This would have been the cause of her unusually large appearance to Jean. Accordingly, it would surely not be so surprising if she lacked patience and empathy with a young child. One event Julia would presumably have enjoyed was the wedding of her seventh daughter, Kathleen, on 24 July 1919, although she probably did not welcome the fact that it was held in St Paul’s Anglican Church in Derby, rather than in the nearby Catholic Church. Nevertheless, it was the first local wedding for her family since Eveline’s marriage in 1905. In 1920, Julia would have received news of the death of her second daughter, Ellen, at the age of 37, in Sale, Victoria. So, after having all 12 of her children survive beyond childhood, Julia had outlived two of them. But, apart from Albert, who died following a burst appendix at the age of 37 in 1941, her other children lived to reach something like old age – Elsie 88, Eveline 68, Walter 85, Eileen 94, Ruby 67, Kathleen 78, William 72, Ella 74, and Arthur 76. Later that year, just under four years and four months after her husband had died, Julia passed away. 1. Elsie Teresa Josephine Crothers, born 28 January 1881 in Brighton district; died 10 May 1969 in Devonport. 2. Ellen Allicoque (Nellie) Crothers, born 4 February 1883 in Brighton district; died 1920 in Melbourne. 3. Eveline Julia Crothers, born 22 September 1884 in Ringarooma district; died 29 September 1952 in Invermay, Launceston. 4. Walter Henry Crothers, born 14 October 1886 in Ringarooma district; died 26 October 1971 in Nannup Hospital, W.A. 5. Elizabeth Mabel (Corrie) Crothers, born 9 October 1888 in Derby; died 12 May 1917 in 164 Liverpool Street, Hobart. 6. Eileen May Crothers, born 19 October 1890 in Ringarooma district; died 11 August 1985 in Launceston. 7. 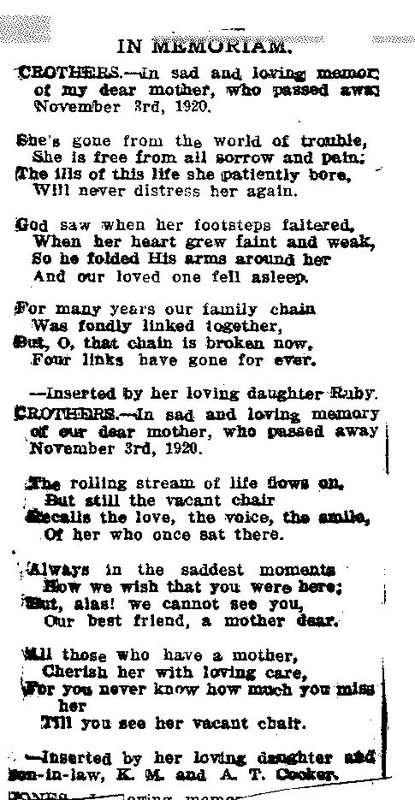 Ida Ruby Crothers, born 19 June 1892 in Ringarooma district; died 9 August 1959. 8. Kathleen Mary Crothers, born 23 January 1895 in Derby; died 18 August 1973. 9. William James (Willie, Bill) Crothers, born 26 November 1896 in Derby; died 5 November 1969 in Ulverstone. 10. Ella Beatrice (Danny) Crothers, born 19 September 1898 in Ringarooma district; died 9 August 1973 in Launceston. 11. Arthur Gordon (Cocky) Crothers, born 2 September 1900 in Derby; died 2 November 1976 in Launceston. 12. Albert Leslie (Kim) Crothers, born 16 November 1904 in Bradshaws Creek; died 26 December 1941 in Scottsdale Hospital.